Elba is trimmed with a triple row of satin cording, perfect for a town house, beach house or inner city apartment. Made in Europe from a 400 thread count combed cotton percale, it is light and crisp to touch keeping you warm in winter and fresh in summer. A perfect addition to your home linen collection. 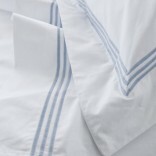 I have just purchased these beautiful sheets. The quality is superb and value for money fantastic. The packaging is also beautiful too.